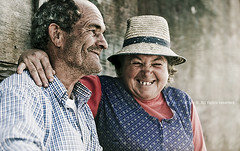 A fishermen couple. She laughed her head off because i told them "you have to sit together, very close to each other" and the husband asks "and kiss?" i answered "you can kiss if you want" She blushed! and he continues "french kiss?" she couldn't hold the hard laughing :)) This photograph makes me really happy!